I am on day 39 of my postpartum recovery, and I thought I’d share my experience. Mine will be different then most because my son is still in the NICU. Also, as a warning: Some of this might be TMI! Immediately postpartum I felt fine. My chief complaints were back pain and exhaustion. The back pain was from the epidural, which is not something I was expecting– though it obviously makes sense. The exhaustion was from a myriad of things. The night before induction I could not sleep, and then my labor progressed quickly for a primigravida not allowing any rest even after the epidural. I also was dealing with processing all of the emotions of finding out my son had EA/TEF and having him shipped off to another hospital, along with trying to develop a breast milk supply by pumping every 2-3 hours around the clock. So when I was discharged from the hospital 18 hours after our baby boy was born the doctor warned me that this ‘fine’ feeling would pass as she believed I was running off of adrenaline. She made my husband promise to keep an eye on me. Physically I needed to take 600-800mg ibuprofen every 6 hours around the clock for the first 3-4 days, and didn’t I felt it. My back stopped hurting by this point, and I hated how the ibuprofen gave me a stomachache! My ‘nether’ region was not as sore as I expected it to be– Sure my stitches itched and burned a little, but using my peribottle and dermoplast every time I used the bathroom was perfect. Until my stitches completely healed (about 3 weeks pp) it felt like I was walking around with a tampon placed incorrectly… Best way to describe it. It was uncomfortable, but not painful. My bleeding pp honestly surprised me– I was fully prepared for bleed like a stuffed hog for weeks, but I would say that by my 5th-6th day postpartum I didn’t need those giant overnight pads anymore and I switched to always infinity foam regular flow with wings. These things were heavenly! I could hardly feel they were there, and they ‘wicked’ away the moisture and kept me feeling dry. About 2.5-3 weeks pp I was mostly just having discharge and only needed liners. I still need the liners, but otherwise I’m good. I was warned about the hemorrhoids and the constipation, but I had no hemorrhoids and actually had mild diarrhea immediately pp. So I didn’t take my stool softener…. but on the 4th or 5th day I was in pain. I was so constipated and had stomach pain that felt like someone was stabbing me below the bellybutton. I took stool softeners and suffered through it. Godspeed my friends! Take the stool softener… even if you don’t think you need it! The lactation consultant informed me that it appeared I had IGT (insufficient glandular tissue), and probably wouldn’t be able to produce a lot of milk. Still, I was going to try! 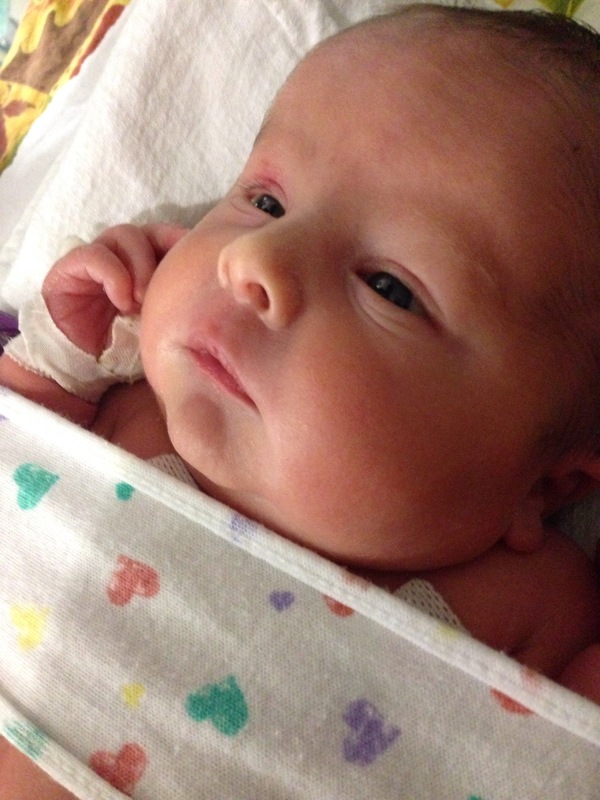 I was loaned a Medela Symphony from the NICU. It is a hospital grade pump made for exclusively pumping and costs close to two-thousand dollars! Luckily the NICU has a free loaner program for mothers to use while their babies are still in the hospital. I pumped every 2-3 hours for 20 minutes. The NICU had pumping rooms so even when we were with him I could pump. I took 9 fenugreek pills a day, drank 4 cups of mother milk tea, held hot compresses to my chest while I pumped, looked at pictures of him while I pumped… and after 10 days the most I had ever produced was 0.2ml (combined from both breasts), and I was so exhausted– in 10 days I had not had more than an hour and half of uninterrupted sleep. I was heartbroken and mourned the loss of my breastfeeding dream. I wish someone had told me that there were really women out there who physically couldn’t breastfeed. I was so unprepared for this, and this was one of the hardest things for me to come to terms with. Even now when someone asks me if I’m using formula or breast milk… I feel like I need to make excuses and explain to them why he’s only getting formula. My husband and myself were both very concerned that I was developing postpartum depression and postpartum anxiety. As an already anxious person, we really didn’t know how much of my pp emotional roller coaster was normal for me. For the first two weeks I was so upset and cried everyday– In the shower, while I was pumping, at his bedside, when I talked to his doctors, when we left to go back to the hotel… It was awful. Now looking back I think I was just dealing with an extraordinary set of circumstances– We went from having a perfectly healthy baby to a baby with a life altering defect who needed surgery, and then he got sick, and I watched him turn blue in front of me… It was agony. What helped me realize that it wasn’t anything more was… When my son was having a ‘good’ day, I had a good day. When he was having a ‘bad’ day, I had a bad day… And it just turned out that he had a lot of ‘bad’ days in the beginning. As for the anxiety– I still feel that from time to time. I have a hard time falling asleep because I’m thinking of him; I’m worried his nurse doesn’t know how he likes to be soothed by having someone talk to him, or thinking his resident forget to weight-adjust his medication for his 100gram weight gain, etc. That I think is just me being a mother… We’re supposed to be worried about our babies all the time, right? My postpartum recovery has been a lot easier on me than I thought it would be. The emotional aspect was probably the hardest. My 6 week appointment is tomorrow (technically I’ll just be 5 weeks and 3 days pp), and we’re going to discuss getting and IUD when I’m 8 weeks pp. My husband and I are thinking we’re done having children (thinking of going through this experience again literally makes me sick to my stomach), but we’re young and don’t want to do any permeant methods of birth control incase we change our minds. I’ve handled hormonal birth control well in the past and I think the Mirena IUD will be a good fit for us– I’m 23, don’t smoke, and have no plans to have children in the near future. We considered ParaGard which can last up to 10 years, (Mirena lasts up to 7), but I think we’re leaning to the Mirena. I’ll fill you in on how that goes later. Wow. What have a learned from the last 3 weeks? You need to go with the flow. As a super type A person, this has been incredibly difficult for me, but I’m getting better at it. Losing my beautiful natural birth, missing out on the golden hour, having a baby in the NICU, having a baby undergo surgery on his 3rd day of life, having a baby face and overcome several bumps in the road to recovery, accepting I am part of the 3-5% of women who physically can not breastfeed, and many other things I’m sure I am forgetting to mention– they have helped me overcome my inability to ‘go with the flow’. Baby C had surgery on the 28th of October. That morning C and I went back to see our baby boy, and meet with the anesthesiologist, surgeons, and neonatologists assigned to his case. They went over some aspects of his surgery, and we passed our cell phone numbers off the nurse who would be updating us throughout his surgery. Eventually they had to take him back, so we gave him kisses, and left teary eyed to wait. We were so excited, and terrified. Finally the wait was up and we learned that the surgery went very smoothly. Our son tolerated it very well, and they were able to repair his fistula with one surgery. He had been impressing everyone since he was born, so we were not surprised that he did so well. We were overwhelmed with joy, and so thankful that he was on the road to recovery. The next few days we faced several bumps in the road. They were worried about his blood pressure being too low, his lack of urine output, and he developed a pneumothorax on his left side. They had to start him on a drug to help his BP, and put in a chest tube to relieve the pneumothorax. Then they had to consult with nephrology because his kidney function tests were showing our boy was suffering from acute kidney injury. 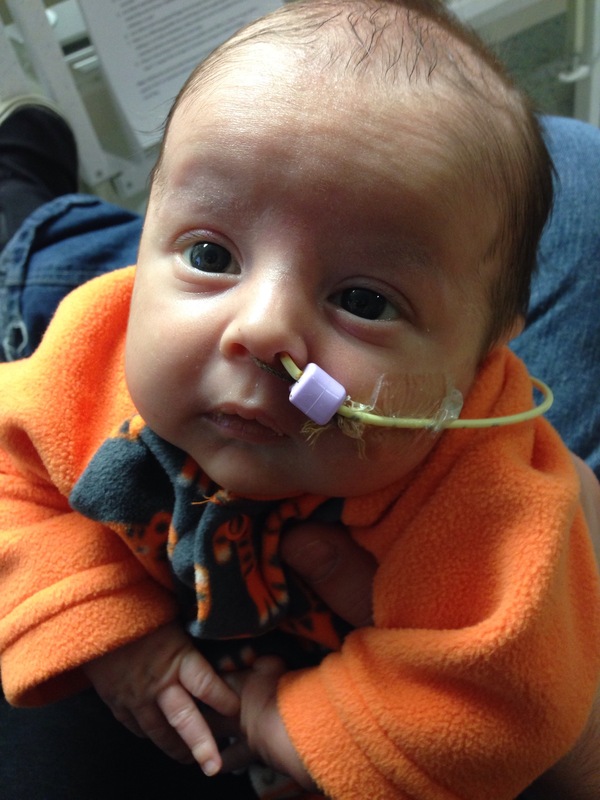 He also wasn’t able to be weaned off of the ventilator because he wasn’t fully awake yet, and they blamed that on his kidneys not filtering everything out. It was several days of constant stress. It seemed like every time we took one step forward, we then took two steps back. Finally on November 1st they were able to remove the chest tube on his right side. Then on the 2nd he started really waking up! When we did his evening care on the 2nd we saw him fully opened his eyes of the first time since before surgery. Then on the 3rd they were doing a test to see how he would handle being off the ventilator, and he did so well that they went ahead and extubated him! On the 4th they did a swallow study to see how his repair was holding up. At first they thought he ‘passed’ but upon closer evaluation the radiologist told us he saw a small leak at the repair. We were so sad to hear that because they didn’t plan on retesting him until the 11th. The only reason we really cared about the extra time is because our son can not have anything to eat orally. He’s getting all of his nutrition IV, but his stomach is still empty and he feels ‘hungry’. He was so upset that night, and we can’t hold him because he still has a chest tube on his left side, and we couldn’t feed him. It took over an hour to calm him down. We felt so depressed and helpless and our hearts were heavy knowing we had another week before he might be able to eat. Today (5th) we took another step forward! His kidney function tests are finally starting to improve. They had kind of stalled out (still high, but were not inclining like they had been) over the last two days, but today was the first day those numbers finally started to come down! Nephrology told us that they were optimistic that this would eventually happen, but until I heard that the numbers were coming down I didn’t believe them. We also learned that surgery reviewed his swallow study results and decided that the ‘leak’ the radiologist saw was so tiny that they felt comfortable retesting on Friday the 7th, instead of waiting a full week. We were elated to hear this. The sooner he ‘passes’ his test, the sooner he can begin oral feedings. 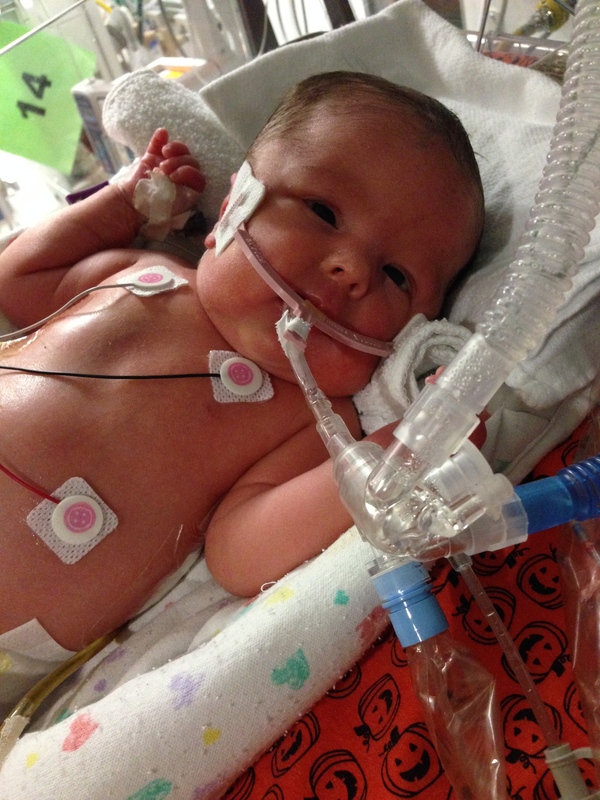 Once he has oral feedings, if nothing is coming out of the chest tube then they can take it out and we can hold him! From there it’ll just be getting him to take a bottle and nurse well before we go home. So our fingers are crossed for Friday. 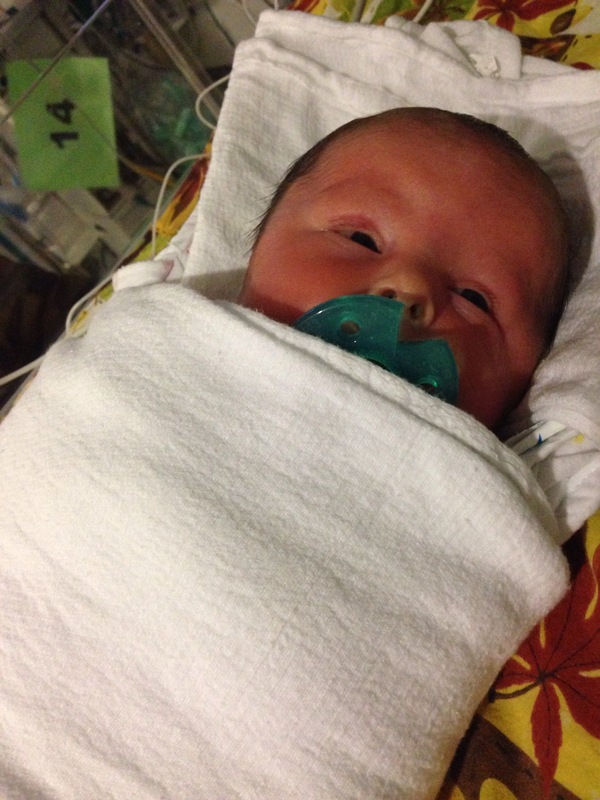 Baby burrito with the pacifier is about the only way to soothe a ‘hungry’ baby. It took several days for us to get a routine down. Running between the hospital and the hotel, trying to find time to sleep and eat, and me pumping every 2-3 hours around the clock– we were exhausted. More than exhausted, we were dead on our feet. I was getting the postpartum blues, and my husband was concerned not only for our son, but feared for my mental and physical health. Being discharged from the hospital 18hours after delivery, and running around as much as we were was hard on my body. I am happy to report now that we are doing a lot better. Not only do we finally have a routine, but I’m doing better emotionally. My husband confessed to me that he was sick with worry for my mental health. For days after being discharged the stress of what was going on with our son, and learning I couldn’t breastfeed had me so depressed I couldn’t muster a smile if you offered cash endorsement. Finally we started getting ‘good’ news, I started to learn how to just take things as they come, and having our routine down– we are in a much better place than we were a week ago. I also came to accept that I can not produce breastmilk* and making peace with that brought me more peace than I can describe. *While my son is in the NICU I’m going to continue to pump (on a less frequent basis than I have been) so that when we do his care I can give him ‘oral care’ with the few drops I am producing. It’s not much, but it is something I can give. Once we go home I am not going to pump anymore, and we will be using formula. Coming to this decision was very difficult for me, but I have the support of my husband and the lactation consultant. This is my journal chronicling some exciting changes as I graduate collage, move to a new city, begin my new career as a RN, explore my options for beginning a midwifery program, and start the lifelong journey of motherhood. I hope to share my experiences with you as my husband and I navigate this journey-- The good, the bad, and the ugly.